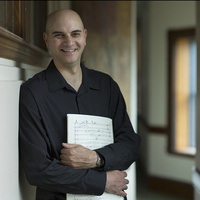 Syrian-American composer Kareem Roustom has been active on the international music scene for over a decade having written commissioned works for the Kronos Quartet, Daniel Barenboim and many others. He has even written arrangements for Shakira and Beyonce, and his work in film has earned him an Emmy nomination. Roustom has been described by The Chicago Tribune as “a gifted and accomplished artist…one of the most prominent active Arab-American composers,” and by BBC Radio 3's classical music host, Tom Service, as “among the most distinctive [composers] to have emerged from the Middle East.” This program will feature three chamber works that are at once rooted in tradition but very much looking forward. As has been the case with much of Roustom's music since 2011, each of these works focuses on the devastating violence in his native Syria offering a wide range of emotions from anger, to mourning and to hope. The Georgetown University Friday Music Series features acclaimed artists in free concerts at 1:15 p.m. on select Fridays. Emmy-nominated Roustom will also discuss his process and problems of representation using clips from films he’s scored including The Mosque In Morgantown, Budrus, 1913: Seeds of Conflict, May in the Summer, The Iran Job, and Amreeka.